Is my cell booster broken if all the lights aren’t green? The weBoost Drive 4G-M and the rest of the weBoost mobile lineup are a great way to get strong cellular signal while on the road. A lot of people got their first cell phones because they were worried about breaking down and despite the laws of this country, a lot of people use cell phones while driving. We don’t judge. If you are going to use a cell phone in the car, truck or RV, you may as well get a good signal. If you’re not an engineer and don’t have a vested interest in the cellular technology in your phone, that’s ok. The important thing to know here is that with all five bands in place, you can get voice and data from all the major carriers in most locations. There are some Sprint cell towers that use frequencies that no one boosts, but even then you’ll have good luck with voice even from Sprint. In most cases once you install your booster, you will have four green lights on the front of it. That indicates all is well. What if all the lights aren’t green? Here’s what the lights mean. Green indicates that the booster is powered and operating at maximum gain. Solid Red indicates that the booster has shut off on the associated frequencies to prevent oscillation (feedback). Green/red Blinking indicates that the booster is operating at a reduced gain to prevent oscillation (feedback). Most likely your booster is not broken, even if you have red lights. Let’s take a look at common scenarios and what to do. Most common: the number of bars didn’t change. Unfortunately the bar displays on your phone are not a good indication of what kind of signal you’re getting. They may be displaying only one frequency, and that frequency may not be responding well to boosting. It may not even need boosting. If there are green lights, the booster is working. This scenario means the booster is working at reduced power. The booster does this automatically. It keeps the cellular network from being overloaded. In general this happens when you go through an area that actually has great cell service. If it’s happening all the time then there’s another issue but if it happens only occasionally and you’re still able to make calls and use data then you’re really ok. There’s no problem here. If you’re seeing solid red lights, this is almost always due to the outdoor and indoor antennas being too close. When the antennas are too close to each other, they interfere with each other and can set up a feedback loop that can overwhelm not only the electronics in the booster but nearby cell towers as well. Modern cell boosters have electronics that shut off automatically if that is happening. In home installs, we recommend 15 feet between outdoor and indoor antennas. Obviously that’s not possible for vehicles. Still, we recommend the outdoor and indoor antennas be as far away as possible. The outdoor antenna should be at least 6 inches from a door or window. Generally, the indoor antenna (the candy-bar-sized piece of black plastic) should go near the front seats, while the outdoor antenna goes on the roof at least 6 inches from the rear windshield. This will usually provide enough separation. Most likely your booster is not defective. Check the connections, reposition the antennas, and if you have questions, call the experts at Solid Signal. 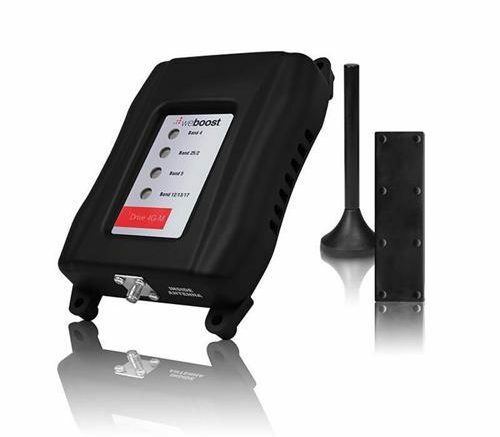 They diagnose cellular signal booster issues for a living and can give you the information you need to make sure that you’re getting the most effective use out of the booster. The number is 877.312.4547. Will a Cellular Antenna Help You?